Visit Garajonay National Park, a UNESCO World Heritage Site, on a hiking tour that also explores the dramatic landscape of Guarimiar ravine. 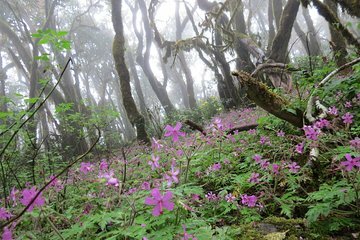 Hiking two different sections of trail means you’ll see Garajonay’s characteristic laurel forests as well as the island’s geology and human history; round-trip transport to the trailheads from selected spots in La Gomera lets you cover far more ground with your limited travel time. Since food is not included, customers have the option to bring their own food or eat at a restaurant in the area. at 10:00, either in the customer's hotel or at the port (the meeting point in the port is the store "Laurisilva", next to the gas station "Disa"
Customers must specify the hotel address where they are staying at.